Here is a challenging star construction you can make from twelve playing cards. The underlying geometric form is the third stellation of the rhombic dodecahedron. However, there is a twist in this design that makes it somewhat tricky (but fun) to assemble. 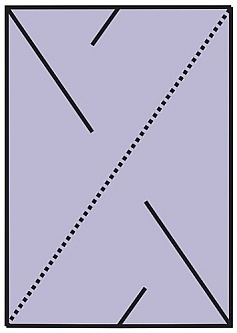 To make your own copy, cut four slits in each of twelve cards, as indicated by solid lines in the template below. Fold each on the diagonal shown as a dotted line. Try assembling them by connecting long slits to short slits, guided by the image above. No tape or glue is needed; it all locks together when the final piece is inserted. If you give up, you can find detailed instructions here. This article first appeared on Make: Online, April 2, 2012.